Apache Tomcat is one of the most popular web servers in the Java community. It ships as a servlet container capable of serving Web ARchives with the WAR extension. It provides a management dashboard from which you can deploy a new web application, or undeploy an existing one without having to restart the container. This is especially useful in production environments. In this article, we will do a quick overview of Tomcat and then cover various approaches to deploying a WAR file. A short and practical guide to installing and configuring Apache Tomcat. 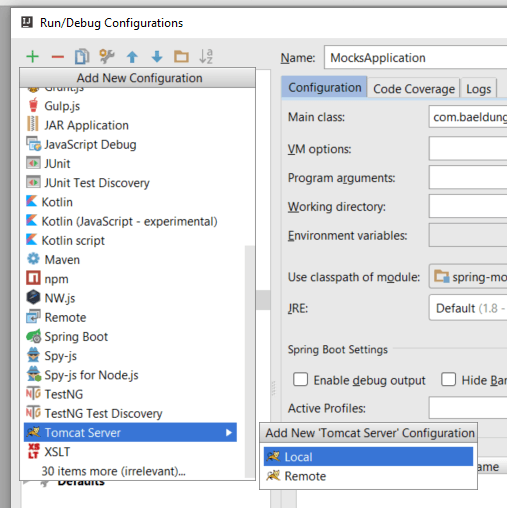 Learn how to configure a Spring Boot application to be deployed on a Tomcat server. Learn how to configure an Apache Tomcat HTTP server to run on port 80. Before we begin, we should familiarize ourselves with some terminology and environment variables. This variable points to the directory where our server is installed. This variable points to the directory of a particular instance of Tomcat, you may have multiple instances installed. If this variable is not set explicitly, then it will be assigned the same value as $CATALINA_HOME. Web applications are deployed under the $CATALINA_HOME\webapps directory. Document root. Refers to the top-level directory of a web application, where all the application resources are located like JSP files, HTML pages, Java classes, and images. Context path. Refers to the location which is relative to the server’s address and represents the name of the web application. For example, if our web application is put under the $CATALINA_HOME\webapps\myapp directory, it will be accessed by the URL http://localhost/myapp, and its context path will be /myapp. WAR. Is the extension of a file that packages a web application directory hierarchy in ZIP format and is short for Web Archive. Java web applications are usually packaged as WAR files for deployment. These files can be created on the command line or with an IDE like Eclipse. After deploying our WAR file, Tomcat unpacks it and stores all project files in the webapps directory in a new directory named after the project. The Tomcat Apache web server is free software that can be downloaded from their website. It is required that there is a JDK available on the user’s machine and that the JAVA_HOME environment variable is set correctly. We can start the Tomcat server by simply running the startup script located at $CATALINA_HOME\bin\startup. There is a .bat and a .sh in every installation. Choose the appropriate option depending on whether you are using a Windows or Unix based operating system. During the deployment phase, we’ll have some options, one of which is to use Tomcat’s management dashboard. To access this dashboard, we must have an admin user configured with the appropriate roles. To have access to the dashboard the admin user needs the manager-gui role. Later, we will need to deploy a WAR file using Maven, for this, we need the manager-script role too. More details about the different Tomcat roles can be found by following this official link. Finally, ensure that there is read/write permission on the Tomcat installation directory. To test that Tomcat is setup properly run the startup script (startup.bat/startup.sh), if no errors are displayed on the console we can double-check by visiting http://localhost:8080. If you see the Tomcat landing page, then we have installed the server correctly. By default, Tomcat is set to listen to connections on port 8080. If there is another application that is already bound to this port, the startup console will let us know. Sometimes, the port we have chosen is not open by default, in this case, we will need to open this port with the appropriate commands in the Unix kernel or creating the appropriate firewall rules in Windows, how this is done is beyond the scope of this article. If we want to use Maven for deploying our web archives, we must configure Tomcat as a server in Maven’s settings.xml file. We will now need to create a basic web application from Maven to test the deployment. Let’s navigate to where we would like to create the application. This will create a complete web application in the directory tomcat-war-deployment which, if we deploy now and access via the browser, prints hello world!. 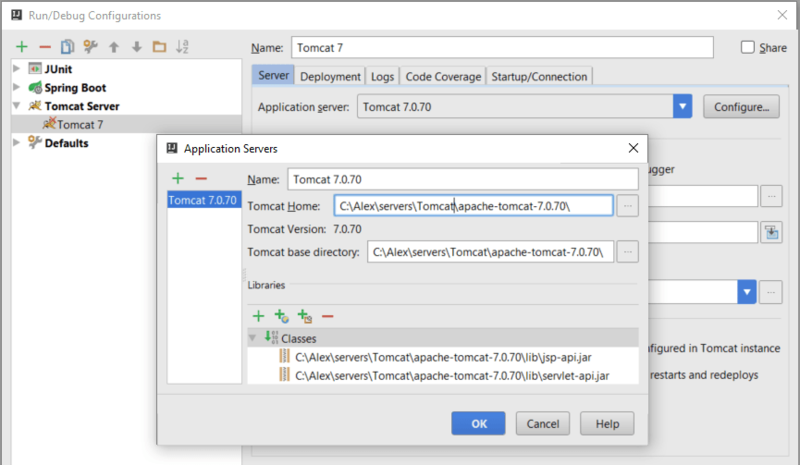 Note that we are using the Tomcat 7 plugin because it works for both versions 7 and 8 without any special changes. The configuration url is the url to which we are sending our deployment, Tomcat will know what to do with it. The server element is the name of the server instance that Maven recognizes. Finally, the path element defines the context path of our deployment. This means that if our deployment succeeds, we will access the web application by hitting http://localhost:8080/myapp. Now we can run the following commands from Maven. Cargo is a versatile library that allows us to manipulate the various type of application containers in a standard way. In this section, we will look at how to use Cargo’s Maven plugin to deploy a WAR to Tomcat, in this case, we will deploy it to a version 7 instance. This will create a complete Java web application in the cargo-deploy directory. If we build, deploy and load this application as is, it will print Hello World! in the browser. Unlike the Tomcat7 Maven plugin, the Cargo Maven plugin requires that this file is present. To enable Maven to recognize Cargo’s commands without typing the fully qualified name, we need to add the Cargo Maven plugin to a plugin group in Maven’s settings.xml. In this subsection, we will edit our pom.xml to suit our new deployment requirements. The latest version, at the time of writing, is 1.5.0. However, the latest version can always be found here. Notice that we explicitly define the packaging as a WAR, without this, our build will fail. In the plugins section, we then add the cargo maven2 plugin. Additionally, we add a configuration section where we tell Maven that we are using a Tomcat container and also an existing installation. By setting the container type to installed, we tell Maven that we have an instance installed on the machine and we provide the absolute URL to this installation. By setting the configuration type to existing, we tell Tomcat that we have an existing setup that we are using and no further configuration is required. The alternative would be to tell cargo to download and setup the version specified by providing a URL. However, our focus is on WAR deployment. It’s worth noting that whether we are using Maven 2.x or Maven 3.x, the cargo maven2 plugin works for both. If all goes well we should be able to run our web application by loading http://localhost:8080/cargo-deploy. To do a remote deploy, we only need to change the configuration section of our pom.xml. Remote deploy means that we do not have a local installation of Tomcat but have access to the manager dashboard on a remote server. This time, we change the container type from installed to remote and the configuration type from existing to runtime. Finally, we add authentication and remote URL properties to the configuration. Ensure that the roles and users are already present in $CATALINA_HOME/conf/tomcat-users.xml just as before. Eclipse allows us to embed servers to add web project deployment in the normal workflow without navigating away from the IDE. We can embed an installation into eclipse by selecting the window menu item from taskbar and then preferences from the drop down. We will find a tree grid of preference items on the left panel of the window that appears. We can then navigate to eclipse -> servers or just type servers in the search bar. 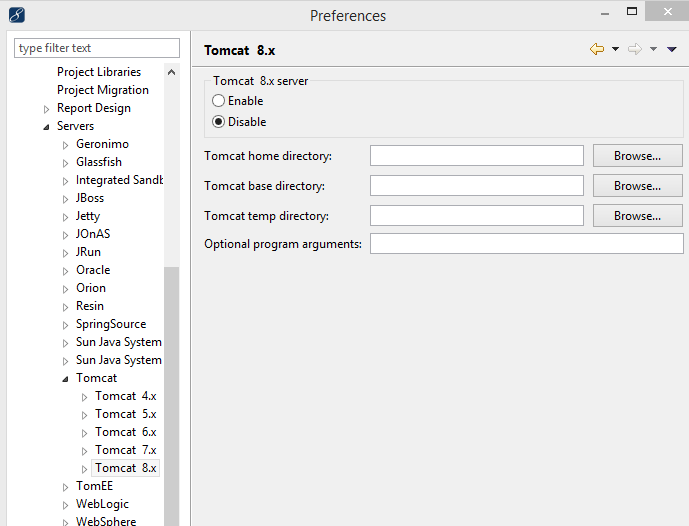 We then select the installation directory, if not already open for us, and choose the Tomcat version we downloaded. On the right-hand-side of the panel, a configuration page will appear where we select the Enable option to activate this server version and browse to the installation folder. 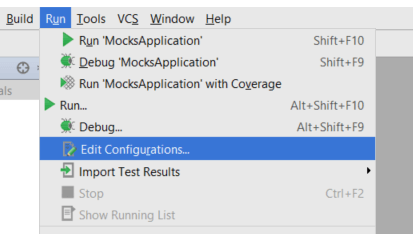 We apply changes, and the next time we open the servers view from Eclipse’s windows -> show view submenu, the newly configured server will be present and we can start, stop and deploy applications to it. 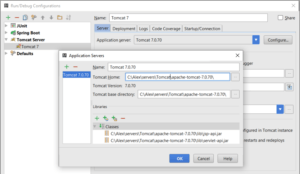 To deploy a web application to Tomcat, it must exist in our workspace. Open the servers view from window -> show view and look for servers. When open, we can just right click on the server we configured and select add deployment from the context menu that appears. From the New Deployment dialog box that appears, open the project drop down and select the web project. There is a Deploy Type section beneath the Project combo box when we select Exploded Archive(development mode), our changes in the application will be synced live without having to redeploy, this is the best option during development as it is very efficient. Selecting Packaged Archive(production mode) will require us to redeploy every time we make changes and see them in the browser. This is best only for production, but still, Eclipse makes it equally easy. We usually choose to deploy a WAR through Eclipse to make debugging easier. There may come a time when we want it deployed to a location other than those used by Eclipse’s embedded servers. The most common instance is where our production server is online, and we want to update the web application. We can bypass this procedure by deploying in production mode and noting the Deploy Location in the New Deployment dialog box and picking the WAR from there. During deployment, instead of selecting an embedded server, we can select the <Externally Launched> option from the servers view alongside the list of embedded servers. We navigate to the webapps directory of an external Tomcat installation. 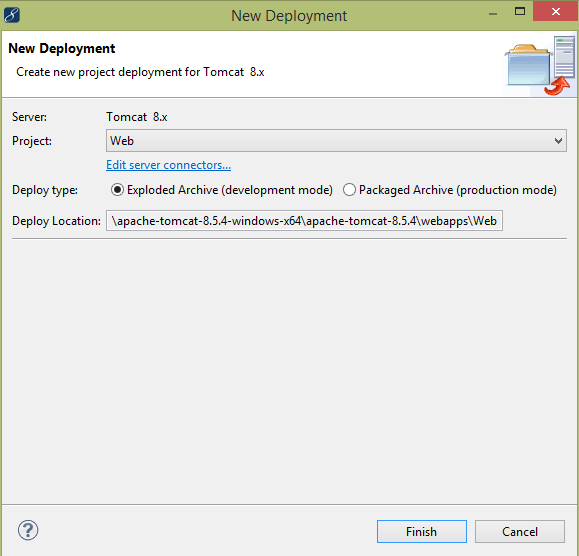 To deploy a web application to Tomcat, it must exist and have already been downloaded and installed. Open the Run menu and click the Edit Configurations options. In the panel on the left search for Tomcat Server, if it is not there click the + sign in the menu, search for Tomcat and select Local. In the name field put Tomcat 7/8 (depending on your version). Click the Configure… button and in Tomcat Home field navigate to the home location of your installation and select it. Optionally, set the Startup page to be http://localhost:8080/ and HTTP port: 8080, change the port as appropriate. 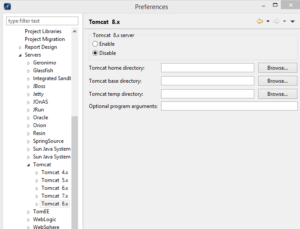 Follow the same instructions as for local Tomcat configurations, but in the server tab, you must enter the remote location of the installation. We have seen how to export a WAR from Eclipse. One of the things we can do is to deploy it by simply dropping it into the $CATALINA_HOME\webapps directory of any Tomcat instance. If the instance is running, the deployment will start instantly as Tomcat unpacks the archive and configures its context path. If the instance is not running, then the server will deploy the project the next time it is started. Assuming we already have our WAR file to hand and would like to deploy it using the management dashboard. You can access the manager dashboard by visiting: http://localhost:8080/manager. The dashboard has five different sections: Manager, Applications, Deploy, Diagnostics, and Server Information. If you go to the Deploy section, you will find two subsections. If the WAR file is located on the server where the Tomcat instance is running, then we can fill the required Context Path field preceded by a forward slash “/”. Let’s say we would like our web application to be accessed from the browser with the URL http://localhost:8080/myapp, then our context path field will have /myapp. We skip the XML Configuration file URL field and head over to the WAR or Directory URL field. Here we enter the absolute URL to the Web ARchive file as it appears on our server. Let’s say our file’s location is C:/apps/myapp.war, then we enter this location. Don’t forget the WAR extension. Additionally, our application should also appear in the Applications section of the page. Just click the choose file button, navigate to the location of the WAR file and select it, then click the deploy button. In this writeup, we focused on deploying a WAR into a Tomcat server.